This feature allows combining internal Report and External Visualization in ONE Viewer regardless of their Data Source. For example, the internal report may be sourced from SQL or some BI tool and Visualization is going to be sourced from Tableau. This feature is an extended functionality presented in Version 4.2 and prior ones. NOTE: It is currently available for Tableau Visualizations only. Find the External Visualization section; the Include External Visualization field is set to 'None' by default. 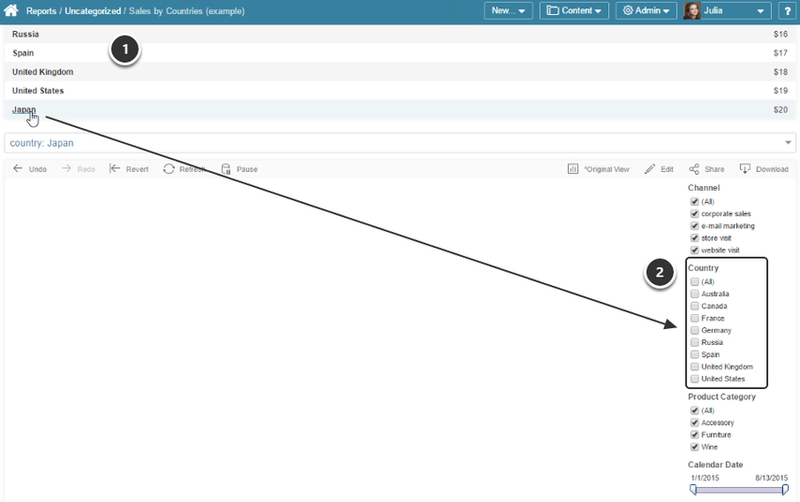 Select the external Report that you have create as a Prerequisite to including Visualization to the Report. This page is dynamic, so additional fields are going to be shown after you select an External Report from the drop-down list. 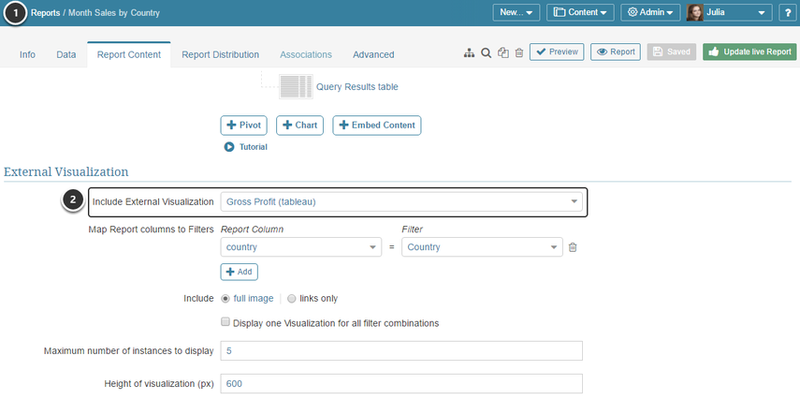 'full image': If this setting is selected, the Tableau visualization is going to be embedded below the Report table and Charts (if any). NOTE: Tableau credentials are required to see the embedded Visualization. checked (click to see the resulting example): If this box is checked, values of the internal Report Table are going to be clickable and by clicking on them a user will be redirect to the Tableau Visualization embedded at the bottom of the same Viewer. clear (click to see the resulting example): if the data in the internal report matches data in the Tableau Visualization, each matching value is going to have its own Visualization. For example, if there are 6 Values in the internal report matching values in Tableau, there are going to be 6 Visualizations. Is applicable if multiple Visualizations are enabled. Maximum number of instances to display: You can limit the number of Visualizations shown on the page at once. If the number of values from the internal Report matching values from Tableau Visualization is less or equal (<=) to the number defined in this field, all of them are going to be shown in the Viewer one after another; if the number of matching Values exceeds the number defined in this field, Visualizations are going to be shown in the drop-down list, but will function in the same way. If Values in the internal Report don't match values in Visualization, the External Visualization is going to be empty. In the example above there is a column of Countries in the Report Table (1) and the Country Tableau filter (2). Most of the values in the column and filter match, but the value for 'Japan' is present only in the internal Report Table and is absents in Tableau, so the Visualization for it is empty.